Unless you spend your life within a metre of a power socket or never actually use your iPhone, it's likely that at some point you'll get frustrated by your iPhone dying at an inconvenient moment. 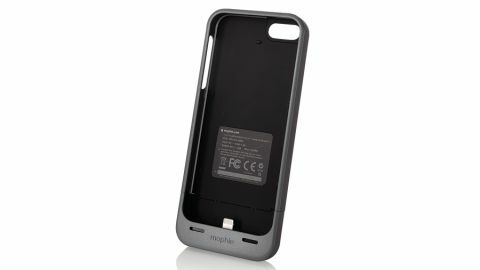 We've come to love Mophie's battery cases, and often depend on them when away from power for a day. Now there's a version for the iPhone 5. Juice Pack Helium for iPhone 5's capacity is even a little higher than the iPhone 5's own battery at 1500mAh (a chunkier Juice Pack Air is also available, at 1700mAh), so you're almost doubling the life of your iPhone if you slip one of these cases on it. Mophie gear has always been well made, but this is a real step up, even from its usual high build-quality. It really feels like a premium accessory, and the iPhone 5 is so slim and light that even adding the Juice Pack Helium's (not excessive) bulk, it still doesn't feel too bulbous. The Juice Pack Helium is expensive, but if you regularly find your iPhone 5 running out of power, we have to recommend it. It's well built, robust, light and looks great on your new iPhone.